We were sent two products from the Arbonne ABC Baby Care range to try out on the little dude. Unfortunately, as soon as we recieved this through the post, the sun decided that enough was enough and the early summer weather was just a teaser. Therefore, we have not had a chance to test this product properly, so if you would like to see how it does, pop back here as soon as the weather brightens, when I will be updating this post. In the meantime, we decided to use it as best we could, as I have pale skinned friends that have managed to burn on a wet cloudy day before - I consider that quite a skill! The sunscreen was easy to apply, and reassuringly thick. The skin stayed white for a few moments after it was rubbed in giving me just enough time to ensure that I had a good coverage before dissapearing. His skin felts slightly moist afterwards, but not particularly sticky as some sunscreens have a tendancy towards. The smell of the lotion reminded me slightly of aniseed but only in a very mild way and was not unpleasant in the slightest. It smelt more like a luxury cream than a sun product. The packaging was less baby-orientated than many other brands, and I liked this as it meant it felt more appropriate to be using myself. For older children, having the bright coloured packaging is wonderful, but for my 9 month old, he is not particularly bothered whether it is cream and lilac or red and blue. This sunscreen is formulated with antioxidant vitamins A, C and E and gentle botanicals. It is PABA-free, pediatrician and dermatologist tested and provides broad-spectrum protection against UVA and UVB rays. Priced at £21 for a 177ml bottle it is at the top end of products, but it smells lovely, goes on nicely and didn't cause any tears. I will update (hopefully) soon with how well it fares in the British sun. UPDATE 23/05/12- We have sun! I am pleased to say that the sunscreen was now had a good testing, and we have a happy and unburnt little man. It seems to be doing the job extremely well, and protecting him from the harmful rays. I reapplied every two hours through fear for his white skin and blonde locks. Here is hoping the sun stays around long enough to finish the bottle! We used the product again and an hour later Dylan ended up with swelling in his cheek and a rash covering half his face. Luckily it went away relatively quickly and the doctors were not worried. It could have been anything that caused the rash but we are being extra careful with what we put on his face now just incase. The ABC range has several baby products including a nappy cream, a body boil and a body lotion. We were lucky enough to try out their hair and body wash. Suitable from birth, it is a mild cleanser that works to replenish the skin rather than stripping it. It protects and moisturisers whilst be suitable for extremely dry skin. Although Dylan has not had any problems with his skin, I had bad eczema when I was a baby, and I tend to be on the cautious side when choosing products for him. We have been testing this product for a little while now and have only positive things to say about it. Dylan's skin feels beautifully soft and not dried out at all after his baths, and even with hair washing, he does not get irritated by the product. Unlike other sensitive skin products, the hair and body wash has a nice smell. mild but nice. I understand that fragrance free means less of the chemicals, but this product seems to have struck a balance between the two, and works great for my little dude. 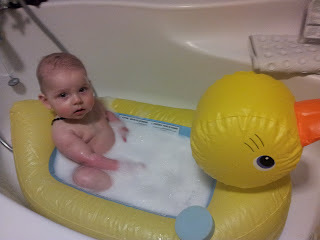 He has always enjoyed his bath times, but now he comes away feeling soft, smelling yummy and tear free. At £12 this is good value, as one bottle will last a long time and looks after your baby's delicate skin. Disclaimer: We were sent these products to review, but all views and opinions are my own. Hey this product seems to be interesting and I like the second one Hair and body wash. The baby line is great and you can even make your own wipes out of the products! I am happy that sunscreen is available for babies also. But i think the parents must consult doctors about the skin type of their baby before using these products. Because baby skin is sensitive and it can cause reaction. Good review for new parents who are looking for safe and also natural ingredient contained baby sunscreen lotion.While buying this baby care product, we have to first concern with its side-effects.I always prefer highly protective against sunlight cream that helps to eliminate signs of sunburns easily.